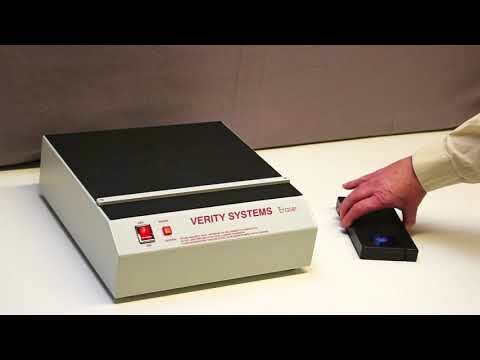 The Verity V94 is a manually operated Degausser is suitable for VHS/S-VHS and Compact, DAT, DLT, Audio cassettes, floppy disks. Computer cartridges: DC, TK 50/70, 3480/3490, 4/8mm. It has a 20 minute duty cycle and is easy to use. The V94 is designed to provide a cost-effective facility to erase a variety of common video and data magnetic media formats, and will appeal to anyone in the video industry who requires a low cost, compact eraser to handle small to medium quantities of cassettes, cartridges or tapes. Operation is simple, safe and is achieved by sliding cassettes, using the guide bar, or rotating tape reels over the degausser’s surface. This provides effective erasure of any previously recorded tracks. The V94 has an automatic thermally controlled cooling fan, allowing the machine to be used to erase large batches of media. Additional electrical safety is provided by a mains supply fuse. The V94 will be of interest to operators in the duplicating, production, CCTV, voice logging and instrumentation industries who will benefit from the increase in quality and efficiency that the V94 MidiGausser will bring.